Win McNamee/Getty ImagesPresident past … and future? There’s a serious argument to be made in favour of Oprah Winfrey running for president in 2020. She could help fill a gap in trust and empathy that has engulfed American politics. She has built her career on an ability to sense what the public wants. I’m not endorsing Oprah Winfrey for president, yet. But I think it’s time for some backlash to the backlash – and to reflect on some reasons she might, if she were to run, prove to be the right person to lead the country. American politics is suffering from a gap in trust and empathy. So many voters believe at least one political party doesn’t care about them or their concerns – that the party prioritises other Americans. A lot of people feel this way about both parties. Our politics might be greatly improved through leadership from someone talented at reaching and empathizing with a broad swath of Americans, across lines of race, class, and income – a leader who they feel relates to them, understands their concerns, and cares about them. Who has more experience at this kind of mass empathy than Oprah Winfrey? Often, successful businesspeople enter politics with an empathy gap. They can’t relate to the concerns of ordinary, non-rich people. But the way Winfrey got so rich was by understanding the concerns, feelings, and tastes of the broad public – and getting people, especially women, to believe that Oprah gets them and cares about them. We saw a preview, in her Golden Globes speech on Sunday, of how she might take that appeal into the political arena. Like Donald Trump, Winfrey has built her career on her intuitive sense of what a slice of the public wants. But Winfrey’s slice is wider, which would make it easier for her to produce an ethos of inclusion instead of division. Of course, if Winfrey enters politics as a Democrat, a lot of Republicans will decide they don’t like her anymore and that she doesn’t relate to them anymore. This is how partisanship works. But she could still draw on some of her cultural capital to be trusted, by some voters, in a way other Democratic candidates could not. And the skills and intuitions that allowed Winfrey to become so well-liked as a media figure would also probably give her an advantage in developing a positive political image, too. Obviously, this is an argument about how Winfrey would be perceived by the public, rather than about how she would do the job as president. But because of the environment of division and low trust, it would be valuable for America to have a president who is liked and trusted by a clear majority of the public and perceived to the least extent possible as belonging to one “side” of society. That is, President Oprah’s broad popularity would be an end in itself. Of course, she would also have to do the job. It would be up to her to demonstrate, in a campaign, that she is up to it. She would need to learn a lot about policy and show an ability to hire and listen to smart advisers who know topics she does not. Basically, she would need to do the things Trump hasn’t done. Maybe she would be able to do that, and maybe she wouldn’t. Democrats will have a very broad primary field, and I think Democratic voters are a little less inclined to reject expertise and experts than Republican voters were. If Winfrey got on the debate stage to spout platitudes and demonstrate ignorance about government, I don’t think she’d be nominated. But I also don’t think she’d be likely to do that. Winfrey’s versatile business career – unlike the president, she is a self-made billionaire – suggests a talent for managing large enterprises and learning new things. I don’t think she would run for president unless she, unlike Trump, intended to take the job seriously. My biggest reservation about Winfrey is her track record of promoting quackery on her show: Jenny McCarthy on vaccines, various Dr. Oz ideas, “The Secret.” Did she believe these things were good? Did she just put them on for ratings? Neither answer is great. I’d want to see her demonstrate that – again, unlike the president – she gets the difference between television and the government, and that she’d listen to experts and reject conspiracy theories. But again, that’s an issue for the campaign. 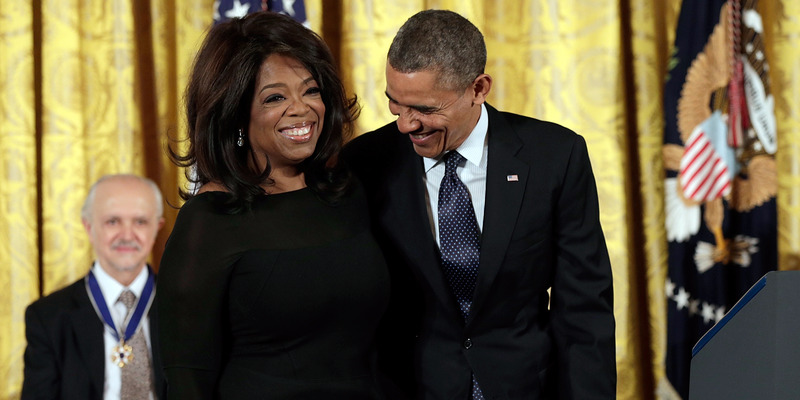 I’m not saying, “Vote for Oprah.” I’m saying there’s a good argument for why she might be the right candidate – if she chose to run and then did the right things. Let’s watch and see.